The latest batch of designers on Bravo and Heidi Klum’s third installment of Project Runway has been announced! Pictured: (top l-r) Vincent Libretti, Kayne Gillaspie, Robert Best, Ulrike Herzner (middle l-r) Alison Kelly, Laura Bennett, Angela Keslar, Keith Michael, Katherine Gerdes, Stacey Estrella (botton l-r) Bradley Baumkirchner, Jeffrey Sebelia, Malan Breton, Bonnie Dominguez, Michael Knight. Season three’s winning designer will be awarded a mentorship with Macy’s private label sportswear line, I.N.C. International Concepts. Hmmm, not quite the same prize as the Banana Republic mentorship of season two. Check out thumbnail pictures of the Project Runway Season 3 cast as well as an ensemble picture of Heidi, Tim Gunn, the Season 3 cast and the models. Project Runway 3 will premiere on Wednesday, July 12 @ 10PM ET/PT on Bravo. Looking for a neat, cheap, do-it-yourself way to wrap something small? Try this gift box made from two bills. You can use any denomination you like, but the cheapest combination is obviously two one dollar bills. 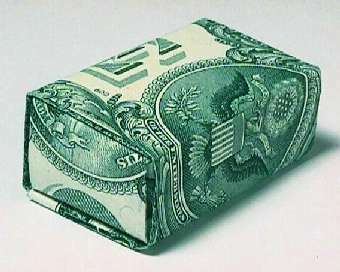 Check out more money origami at Clay’s site. 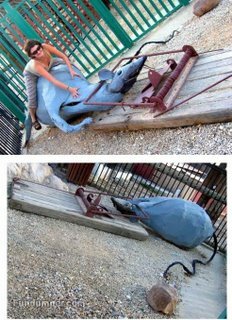 Art and sculptures on children’s playground is supposed to be fun, whimsical, and merry, right? Well, that’s what I thought. Take a look at these pictures and you’ll see that there’s some pretty creepy/disturbing playground art out there. 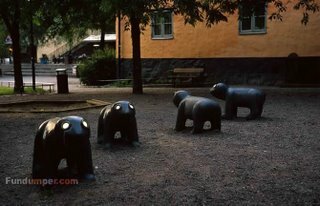 What are your children playing on/around?